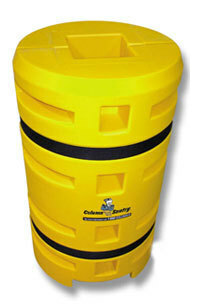 If you are looking for a post, column protector or rack protector, First Aid and Safety has just the selection you need. Our selection can help secure interior building columns or offer a flexible alternative to warehouse rack protection systems. We offer Sentry's complete line of Column Sentry, Rack Sentry, Concrete Wrap, Corner Protectors, Park Sentry and Collision Sentry products to keep your facility well protected. The complete line of Sentry products are easy to install and most without any tools needed. They are all extremely effective at preventing damage to your facilities columns, racks and other structures that you are protecting. Sentry has been creating these impact resistant protection products since 1998 and are known worldwide for their innovation and quality. They continually work to introduce new ideas to further enhance the protection of your facility. Sentry's goal has always been to guard your facility like it was their own. Bollard Post 6" Round by Eagle 42"H x 6.625"